One Chinese vegetable that I always miss when I’m in London is green garlic, which the Sichuanese call suan miao 蒜苗 and people in other parts of China call qing suan 青蒜. These leafy, pungent alliums are the most common vegetable accompaniment to twice-cooked pork 回锅肉, and are also traditionally added to mapo tofu 麻婆豆腐. In Hunan, they are often used in simple stir-fries, perhaps with some of the glorious local smoked pork 腊肉. It’s rare to find them in England, so imagine my delight to find them on sale just before the Chinese New Year! You can see them on the righthand side of the chopping board in the picture on the left. As you will notice, they look very similar to Chinese green onions (a.k.a. 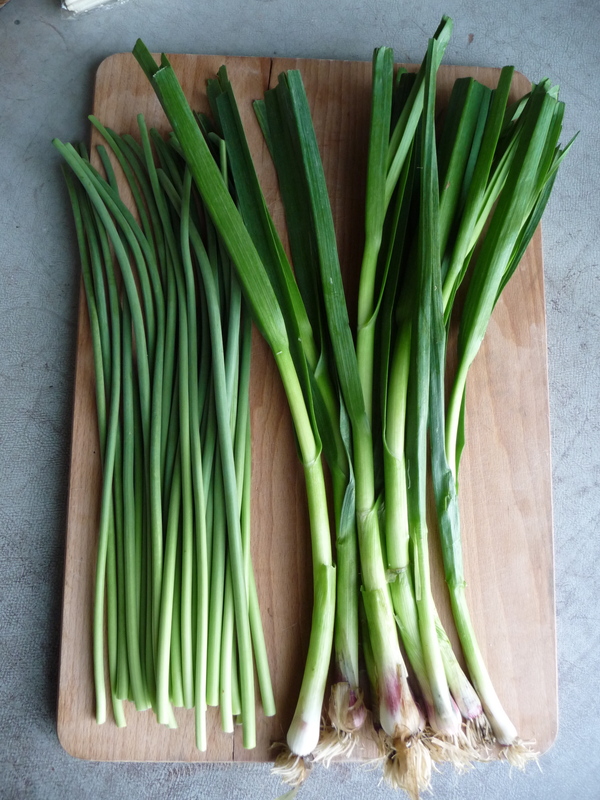 scallions, spring onions), but they have flat leaves, like leeks, and a hint of purple around their bulbs. In my Sichuan cookery book I recommended using baby leeks for twice-cooked pork and spring onions for mapo tofu because green garlic is so rarely available, but if you can find it, snap it up and use it instead! 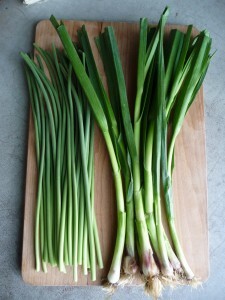 (it takes rather less time to cook than baby leeks, and marginally longer than spring onions). On the lefthand side of the board are garlic stems (known confusingly as suan tai 蒜薹 in Sichuan, suan miao 蒜苗 in Hunan and suan xin 蒜芯 in at least some Cantonese areas. In China, they are often sold complete with their little bulbs on the top of each stem; here in England, where they can be found in some Chinese greengrocers, they are usually trimmed and bulbless. Raw, they have a strong and forthright pungency, but when you stir-fry them they become sweet and mellow. They are heavenly stir-fried with cured meats or firm pressed tofu. Interesting. I think I wrote you an email about this topic recently, so happy to see an “authoritative” answer, and this confirms my suspicion that, as with many Chinese vegetables, there is great regional variation as to what things are called. The type I’ve seen sold as 蒜苗 here in California, with the English description “Taiwan Leek”, looks more like the type on the right. My in-laws (who came from Shanghai, though my mother-in-law grew up in Vietnam, and her family is from Guangzhou) both say that 蒜苗 refers to the young stem, similar in appearance to 韭菜花, but often with a curved stem — I guess what you’d call a “garlic scape” in English. Here in California (where garlic can grow year-round, and where a lot of Asian vegetables are imported), I’ve been able to get green garlic at the Asian market through the winter; sometimes the bulbs seem a bit over-developed, or have even been cut off, though. At the farmers markets, it seems to be much more seasonal. In Sichuan and Hunan, are these available year-round, and if not, what do people usually use instead? In America, suan miao are commonly referred to as “garlic greens”, and are fairly easy to find in urban farmers markets when in season. I was rather confused by your description of suan miao in your book, because where father is from (Jinan) “suan miao” is produced at home by soaking garlic cloves in water until they sprout; when the green sprouts reach about 4-6 inches, they are snipped, chopped, and used as a wonderfully pungent garnish or topping. It’s completely impractical to do this at the scales needed for twice-cooked pork, and it wouldn’t have the required texture either. However, you can grow them indoors at any time of the year, and it’s been a nice treat since moving into an apartment building with no garden. I think I need to take a trip to a Chinese supermarket soon, these look like fine additiion to one of your recipes. I have got lots of Chinese vegetable seeds to grow on my allotment this year. One of them is Chinese celery which I have never had before. I could do with some of these garlic stems too! This is very helpful, as I always wondered what green garlic even looked like. The garlic stems are easily found in Berlin, as they are common in vietnamese cuisine as well, but I don’t think I’ve seen green garlic around here. Well, at least now I know what to look out for! @Postercowboy — Just be aware that “garlic chives” — jiǔ cài (韭菜; gow choy), often called Chinese leek, look very similar to the picture on the left. However, they are not the same thing. Jiucai can be either green or yellow (I believe the latter are cloaked from the sun), and can come with or without a flower on the top. ‘garlic chives’ look a bit similar from a distance, but if you go closer you’ll see they have flat, spear-like leaves, whereas the garlic stems are round and thick, like stems. As Will says, they can be either green, or very pale yellow (these are blanched like chicory). The ones that have flower buds on top are flowering chives (韭菜花）, and they are thinner, shorter and less ROUND than garlic stems – the stems tend to be less smooth,so if you hold one in your hand you can feel its edges. There will be pictures of all of these in my forthcoming book. I may try to post a photo of the chive varieties at some point in the meantime. @Dan L. thanks for the tip on at-home sprouting. I had a recently purchased garlic head which must have been a bit old (and un-treated), as it started to sprout right in the drawer. I sprouted a few cloves in water, and within a few days, I had some small sprouts. They were delicious with savory steel-cut oats, and in a wheat-gluten “intestine” stir-fry. Hey there! In the south here (Fuzhou) they just call them 大蒜 (da suan), never heard the other names! A friend taught me the fried tofu and da suan recipe the other day and it’s fantastic – simple, easy and perfect with plain rice or congee. This is a great clarification, I wish I’d read it earlier. I’m taking classes in the Sichuan Higher Institute of Cuisine right now (inspired and motivated by Sichuan Cookery, of course). Thanks a lot, and best regards! Glad it’s useful, Katya, and hope you’re having fun in Sichuan! Here in US, if we couldn’t find the Chinese garlic leaf (the way many chinese supermarkets call), we use elephant garlic leaf instead. 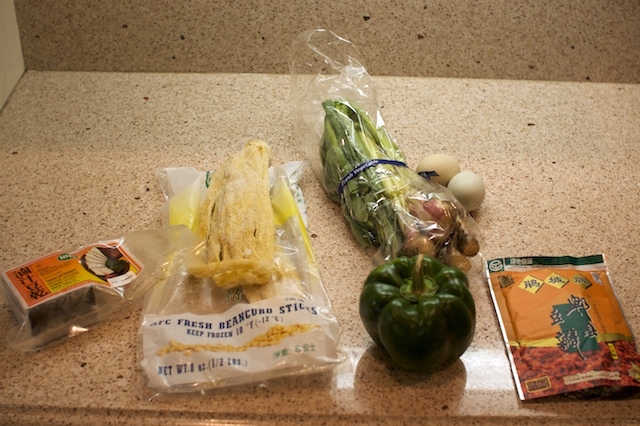 It is used to almost all stir-fry dishes by adding shredded into at the last minute. I’m quite excited to finally find a photo and description of the glorious vegetable– garlic shoots or garlic stems ( suan tai 蒜薹 ) that I miss, & loved so much when I lived in China. I lived in Sichuan Province, in Nanchong (along the Jialing River). “Suan Tai” was something we ate frequently, sometimes stir-fried alone. It was heavenly when stir-fried with shredded pork. It wasn’t garlic-y but very full-flavored, almost nutty. It stayed crisp on the outside (but never woody or chewy) while the white-ish middle was more tender. There’s no substitute for it! So here’s my question: I now live in Eastern PA & would give my eye teeth to learn exactly what SPECIES of garlic this suan tai 蒜薹 is!! I’d like to try growing it, if that’s possible in such different climates! Does anyone know a source for the bulbs, or someone I could contact who would know how to grow it? I haven’t found a bulb description online that focuses on what the edible stems are like, so I don’t know if any of them are the correct variety to try growing for suan tai 蒜薹 . If anyone knows, please post here– thank you kindly. And thank you for this description, even though I’m drooling now from the memory of this wonderful food! The market by me hasn’t had garlic shoots 青蒜 recently, but now they have suantai (蒜薹), imported from Mexico. These are the stems of garlic, I guess you’d call them “garlic scapes” or “green garlic” in English. Confusingly, but not surprisingly (due to all the regional differences in naming conveentions), I think both are labeled as 蒜苗, though the English name is different. Winsome – you could check local farmers markets. I’m not sure if it’s grown in your area, but spring is the usual season for garlic scapes in most of the US, so you may be able to find some. Glad to see Fuchsia has some illustrations of the various types of garlic chives, garlic stems, etc. in the new book, though it doesn’t clarify some of the finer points alluded to here in terms of regional differences (the item on the right in the picture above isn’t pictured or discussed). What a joy to find a picture for green garlic, of course at the Source itself… I too would very much like to grow my own. Both suan miao and qing suan I stumbled upon in asian grocery stores, but too rarely. I have found seeds of allium fistulosum but this appears to be an onion, as well as seeds of allium tuberosum (these are the garlic chives, I think). Fuchsia, would you know the latin names, or be able to find out? The web stays dumb in this matter. Btw, thank you so much for your books. It’s all I ever cook from. Nothing compares. If one goggles “Chinese leek” most of the results concern Chinese chives, Allium tuberosa, although some of the photographs are obviously of green garlic, which I gather is just immature garlic before it has formed a bulb. Some people say suan miao is related to elephant garlic. Can’t one just plant a bunch of garlic cloves close together any time of the year and get green garlic?